Part of the problem, in my estimation, is that malted barley makes a base spirit that is challenging in itself—a flavor that doesn’t show up in very many of our everyday foods. The other thing that makes Scotch a difficult ingredient is the aggressive flavor of the peat that is typically used to fuel the barley drying kiln. It is a big, overbearing flavor, and presents real challenges to anyone trying to make balanced, accessible cocktails. I have nothing against Scotch—a nice pour of quality Scotch, all by itself, is a fine way to end an evening—but I had pretty much given up on Scotch-based cocktail formulas, especially the “old school” stylings included in the classic bar manuals that I normally draw from. Then my bride gave me a copy of Brad Parsons’s 2016 Amaro: the Spirited World of Bittersweet, Herbal Liqueurs , which introduced me to a whole new avenue of exploration. It turns out that amari—those big, bittersweet Italian aperitif and digestif liqueurs—often seem to match perfectly with the barley and smoke of Scotch whiskies. The pairing isn’t a panacea, and doesn’t work for all amari, nor for all Scotches, but the combination provides true opportunities for successful new flavor combinations. One of my favorite examples is a riff on the Old-Fashioned that Parsons attributes to Bangkok bartender Liam Baer, the Choke and Smoke Cocktail. Stir all ingredients with ice until well chilled; strain into a double old-fashioned glass over a large piece of ice. Express and garnish with orange zest. Heat and stir the sugar and water until mixed. Allow to cool, then add rum. The Talisker is a curious Scotch whiskey, long on smoke, but without the pronounced peatiness that often accompanies that smokiness. It also has some salty, slightly orange fruit notes, and a very pleasant spiciness. Cynar has become something of a bartender’s darling in the last few years. 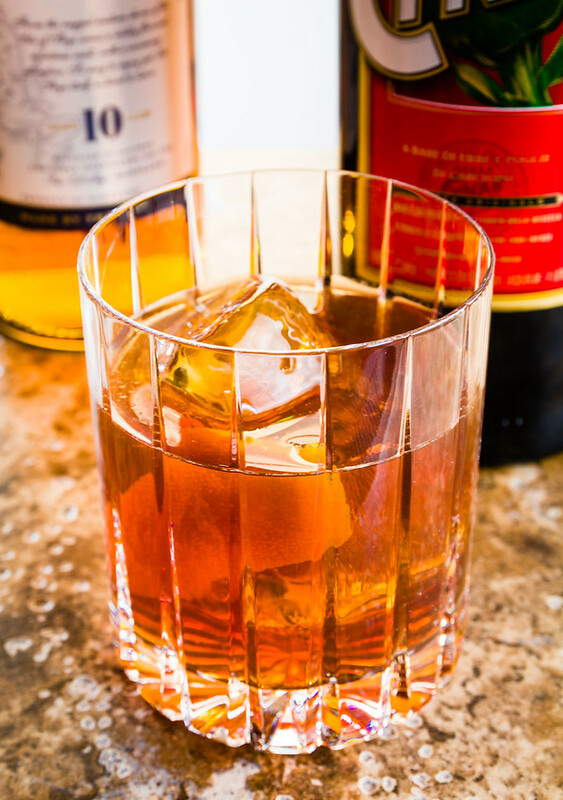 It is, as Parsons notes, a very “cocktail-friendly amaro.” It famously contains artichoke, and has a vegetal, earthy body and a sweet, caramel note on the finish, and makes a perfect foil and counterbalance for the dry, spicy smokiness of the Talisker. I’ve long been fascinated by amari, and combining them with Scotch was a real eye-opener. I won’t go so far as to say that amari combinations could open up some “golden age” of Scotch-based cocktails, but can promise you that, based on the success of the Choke and Smoke, I’ll be mixing and matching Scotches and amari, looking for promising combinations, for a long time to come. One more thing: the Choke and Smoke is a riff on another Scotch and amaro cocktail, Mark Allen’s Smoking Gun, which is similar in structure, but calls for the even more aggressive Fernet Branca instead of the Cynar, and amps up the peat with Laphroaig Scotch instead of the Talisker. It’s an acquired taste, but if you enjoy the Choke and Smoke, then the Smoking Gun might be your next step in Scotch and amaro land. “Cynar and Scotch: The Choke and Smoke Cocktail” at cold-glass.com : All text and photos © 2017 Douglas M. Ford. All rights reserved. Great post as usual. This is the fourth reference to Amaro in the past week that I’ve come across, and about the fifth reference to Fernet-Branca but I’ve come across in the past month. So a little bit of serendipity I think. And of course as I was reading your blog, I’m sipping some Scotch myself. A nice end to the week, a drink and your blog post. That’s very uplifting, thank you. The photos are Fantastic! Love the post! Thanks for sharing! I look forward to trying this. I remember the first really peated Scotch I ever had. My father bought it for me as he was leaving a restaurant that was currently featuring a drink I’d made to help them clean out some old stock. It was 16-Year-Old Lagavulin, and it was wonderful. I spent at least 2 hours drinking the pour and breathing in the smell. It was the first time I’d ever encountered a liquor that could be considered savory; it reminded me of bacon. I’m always glad to see new drinks that can hopefully incorporate that smoky taste. Death and Co.’s book includes a recipe for a drink called a Coffee and Cigarettes, essentially a Manhattan with Laphroaig and coffee liqueur, I think Galliano Ristretto. I could never find the Ristretto, but homemade coffee liqueur still made for an excellent drink, in my opinion. I often thought about trying some sort of Mexican variant with Del Maguey Chichicapa or some such smoky mezcal, and Patron XO Café. I never did get around to it, though. Come to think of it, I might make something tonight with Suntory Hakushu and some espresso-infused demerara syrup. Any past or present smoker can tell you that coffee and smoke is a winning combination. Lagavulin is a very pleasant way to start on peaty Scotch, congratulations on that. Glad you enjoyed the article. Great post. Great combo. It’s funny you referred the Smoking Gun as just last night I mixed myself a hot and toddy with 2oz Laproiag, 1/2 oz fernet branca, 3oz hot water and a few dashes of spicy orange bitters. It was great, and if you like the Smoke and Choke I’m sure you’ll love it. Sounds interesting, I’ll give it a try—as soon as I restock Laphroaig. I started looking for posts on rye whiskey, but instead ended up here. As a fan of off cocktails and unusual flavors, this is intriguing. Excellent post. Keep up the good work, you just earned yourself another follower. I’m delighted, thanks for letting me know. Love your cocktail histories. Don’t ever stop! The Scotch Lodge: 1.5 oz Scotch, ½ oz Cherry Heering, ½ oz Cynar, ½ oz Punt e Mes. Orange twist garnish. The original used Combier Rouge, which I do not have and so replaced with the Heering. I used Monkey Shoulder blended Malt Whisky, which is not very peaty. I only recently became aware of the Scotch Lodge, and I haven’t had a chance to try it yet—this motivates me to do some experimentation. The recipe that I found also suggested Zucca as a substitute for Cynar, which seems reasonable, and adds a dash of orange bitters. I look forward to trying it, thanks for the suggestion, and for the idea of Heering as a sub for Combier Rouge, which I’ve not seen in my region. Sounds good. Plus, I’ve always thought rum and apricot (or peach) brandy were a nice combination. Thanks! Thanks for the shout and glad you enjoyed the drink! Yeah, it’s a good one. Thanks, Liam.